Celebrating the life of Rev. Andrew Cammenga Jr.
Be the first to share your favorite memory, photo or story of Rev. Andrew. This memorial page is dedicated for family, friends and future generations to celebrate the life of their loved one. Obituary for Rev. Andrew Cammenga Jr.
At age 82, after complications from a battle with Multiple Myeloma, Rev. Andrew Cammenga Jr. was taken into the presence of his Lord and Savior Jesus Christ on January 16, 2019. Cam leaves behind many relatives and a vast number of people who loved him and benefited from his biblical instruction, counsel, and friendship. But he will be most deeply missed by his life-long partner and devoted wife Millie and by their children (Ellen & Scott Korthuis; Mary & Bradd Nymeyer; Andy & Brenda Cammenga; Carol Hagedorn); 13 grandchildren (Kathryn, Matthew, Jeffrey; Nicole, Kristen, Joshua, Rebecca; Shelli, Andrew, Janelle; Davis, Justin, Shannon) and their spouses; and 7 great-grandchildren (Blake & Avery; Jonathan & Levi; Mikayla, Alexa, Jonathan). His family does not grieve as those without hope (I Thessalonians 4:13) but truly rejoices that he is now with his “faithful Savior, Jesus Christ, Who has fully paid for all his sins with His precious blood…” (Heidelberg Catechism, Q&A 1). Andrew was born to Rev. Andrew and Tillie (Visser) Cammenga on June 11, 1936 in Rock Valley, Iowa. The Cammengas moved to Grand Rapids, MI in 1949 where he attended high school and met Mildred Wiersma—the love of his life. Their relationship was put on hold from 1955-1957 while he served in the U.S. Army in Korea. Upon his return, Cam and Millie were married on May 1, 1957 in Grand Rapids, MI. For two years, beginning in 1961, he struggled privately with what seemed an insane call of the Holy Spirit to pursue a preaching ministry—insane, in Cam’s mind because he had no college education, hated school and was certain he could serve God better as a good salesman rather than a poor preacher. Unable to shake the calling he finally shared his struggle with Millie during a camping trip in September 1963 -- certain she would give him a final reason to ignore the Spirit’s call. Not so: she didn’t laugh, instead believed God would provide if He was calling. Two weeks later Cam was a late enrollee at Calvin College taking Freshman English and Latin. During the next 7 years of college and seminary, with a family of four children, God did supply all their needs: a night job in a factory during the school year, house-painting in the summer, odd jobs and Tupperware sales for Millie; even anonymous help for the children’s Christian School tuition. God’s amazing provisions and divine encouragements were clearly seen during those difficult years and His faithfulness continued throughout their marriage of 61 years. Cam spent summers in preaching internships at Bethel Christian Reformed Church, Lynden, WA (1968) and at Conrad Christian Reformed Church, MT (1969). He served as a Minister of the Gospel in Brookfield Christian Reformed Church, WI (1970-1976); Second Christian Reformed Church of Lynden, WA (1976-1985); and Escondido United Reformed Church, CA (1985-2000); and was an Emeritus minister at the United Reformed Church of Lynden. Rev. Cammenga loved children and his sermons would include examples and illustrations to help children understand the truths of Scripture. Cam always loved wood-working; he built furniture and two camping trailers but his capstone project was an ocean-worthy wooden vessel launched in 1992. This project took “five years of Mondays” to complete and enabled him to enjoy his other preferred leisure activity: fishing. Upon retiring in 2000, Andy and Millie lived on four wheels for 15 years; they truly enjoyed the adventure of their motorhome years and the ability to extend their ministry -- serving a dozen churches for 2-4 months at a time. 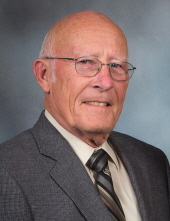 Viewing/visitation from 4:00-6:00 PM on Friday, January 25, 2019 at Gillies Funeral Home (202 Front Street, Lynden WA 98264). A private burial will be officiated by his son-in-law, Rev. Bradd Nymeyer. A memorial service is planned for Saturday, January 26 at 11:00 AM at North County Christ the King (1835 Liberty Street, Lynden) officiated by the Cammenga’s dear friend, Dr. W. Robert Godfrey of Escondido, CA. Memorials can be made to Westminster Seminary California. To send flowers or a remembrance gift to the family of Rev. Andrew Cammenga Jr., please visit our Tribute Store. "Email Address" would like to share the life celebration of Rev. Andrew Cammenga Jr.. Click on the "link" to go to share a favorite memory or leave a condolence message for the family.